I'm having difficulty finding pipe cleaners to use to scrub out my airbrush, I'm only coming across cheap, brightly-colored arts and crafts ones. Am I actually looking for legitimate, tobacco store quality pipe cleaners, or are arts and crafts style ones ok? You live in NJ, so you must have some Tobacco shops locally. Also try Walmart, K-Mart, and even Michaels. I use the ones that come in a Yellow cardboard package. Been using them for literally the last 40 years. They're the thinnest ones I've found. Don't use the one colored ones, or the stiff bristle ones. I'm not sure if the color will bleed from the lacquer thinner or not. Also, cut them in half, and you double the qty per package. Interdental brushes work too, although I'd guess they probably cost more than pipe cleaners. I got a pack of 12 and they seem to last quite a long time, though. I think just about any pharmacy should have them. My solution to cleaning dirty AB's. Get a sonic cleaner for jewelery and fill it with water. Get a glass jar and fill it with lacquer thinner. Put the AB parts in the jar (in this case I have the parts and the business end of one of my AB's). Set the timer (mine maxes out just under 4min). Voila a clean AB. Robbie, A Sonic jewelry cleaner certainly would do the job. Cost, time to setup, clean/dry, and put away, are all issues that each of us would have to come to terms with if one decided to go that route. I'm just basically lazy, kind of cheap, and definitely set in my ways. I can remove the paint cup, needle & cone, clean, dry, and reinstall in less then 5 min. Using the Sonic jewelry cleaner, I would gather that you still have to dry the parts with a pipe cleaner and a Qtip. It would also cause me to have 2nd thoughts to air brush a few small parts. The one thing I must say I have done is cut down on the fumes/vapors especially using lacquer thinner. I am really no longer spraying thinner through the AB as much anymore. The only fumes I do get are when the cleaner is being used but it is not as bad. Yes I have a AB cleaning station to blast thinner into but still there is fumes. Of course with acrylics that is really not an issue so instead of tossing parts into the cup of thinner they just go into the water. So the only AB woes I currently have is using Humbrol Acrylics. Just might have to rethink my position. That's brilliant! I just ordered a sonic cleaner last night. Thanks for the tip. Oh as an aside: I found that Pinesol in a small jar is great for cleaning airbrush tips that are really fouled with acrylic enamels. Here is the initial link that got me interested in ultrasonic cleaners. I want to make sure it was not just my idea. I slightly modified my cleaning procedures buy using a small jar to hold thinner/solvent instead of using ultrasonic cleaner and or other cleaning ideas mentioned in the article. I used to think my ABs were clean. I got so much gunk out of them its amazing! All right, yet another setback... the airbrush is CLEAN, I've soaked everything repeatedly in lacquer thinner, I bought a new #3 needle, went along with pretty much everything that was suggested in this thread. Finally gave it another go tonight, aaaaaaaand... this happened. I was testing it out a bit. 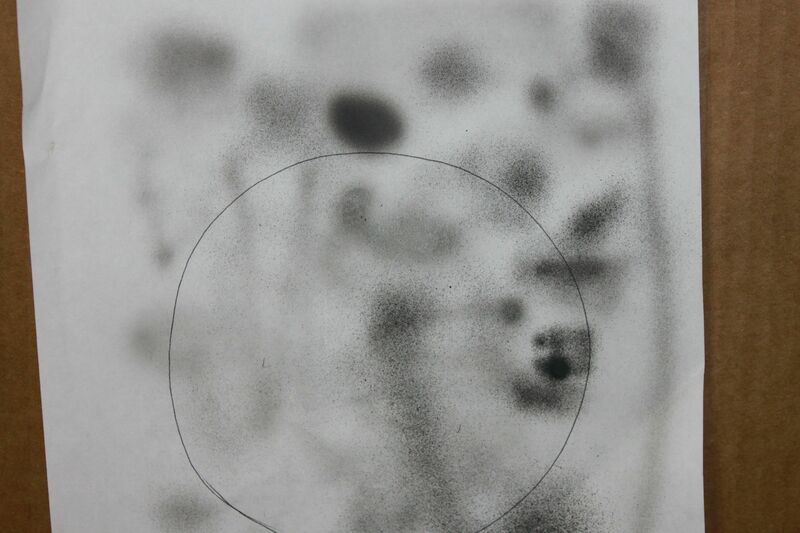 The large gray patch right above the circle drawn on the paper was how it was coming out at first. Confident with that, I painted most of what I needed to get done. However, within a few minutes, the paint started splattering no matter what I tried, opening the cone more, thinning it, etc. Pretty much everything else on the paper is there to illustrate the splattering. I'm hoping this is something silly I did with that paint, and not an airbrush issue. Can anyone tell me what's wrong? make their way into the paint passage and clog the nozzle. to trap chucks of dried paint or a small blob of unmixed paint that may have fallen in. How old is the paint? The paint does appear to be rather old, I'm not entirely sure when I bought it. As for a filter, if you're referring to a water-trap I already have one hooked up. bottle on the airbrush, from being sucked up into the nozzle. that might be in the paint mix. Don't think that the paint splatter issue was caused by chunks of old, hard paint. They would just clog the needle or cone and no paint would come out, or very little. You're getting way too much paint for that to be the case. Lets start with exactly what you're doing. what psi are you air brushing at? What paint/thinner ratio are you using? Have you just used straight Thinner through the gun and was able to air brush it consistently, for lets say half a bowl? For now, don't use the jar as you could be sucking up air if there isn't enough paint in it. Use the cup that came with the gun. I use it 95% of the time. In my humble opinion, 25psi is twice what you need for air pressure with enamels. The maximum effective range of an EXCUSE is 0 meters! Hi Joel, sorry for the delayed reply. Thanksgiving, holiday shopping, etc. I am using Testors Modelmaster enamels, with Testors' brand thinner. I only use the paint cup that came with the brush, I've never tried to use the jars. Thinner/paint ratios is about 50/50. Now, as for PSI, here's where I'm a bit confused. I have a PSI indicator. When I initially turn my compressor on, it sits at about 60 or so PSI. When I start to spray the airbrush, it drops down to about 25 PSI. Which level is the brush actually spraying at? This photo is the assembly I use, it's a Paasche compressor and although I don't remember the exact brand of the PSI meter and moisture trap, it's the exact one pictured. Aaand this is where I bring up that I'm not exactly sure how to adjust the PSI on my compressor. 60 PSI is way too high. Drop it to 15 or 10. When you see your gauge drop when you are spraying is because whatever your setting is, is what is going out your airbrush. The meter will drop because there is no pressure to measure as you spray. That setting is what is going out your airbrush. It appears that the pressure adjustment is made using the black knob just beside the pressure gauge. Compressors like that are the reason I like using one with a tank. It's much simpler to get a consistent pressure out of it. It's been a long time since I used a compressor without a holding tank. Your compressor motor is always running in order to pump air, the psi is usually regulated by a knob on your moisture trap, as your compressor doesn't come with any valves to adjust the out psi. The longer your compressor runs, the hotter it gets, and that changes the psi, but the out valve should still keep it within it's acceptable range. With a tank system there are two gauges, one for the internal psi, and one for the out psi. As Jessica said, with a tank the pressure is regulated and consistent, & the air is at room temp. The other issue, and it's a major one, is that with a tank the flow is smooth and constant. With a continuous running diaphragm compressor, the flow is not smooth, but rather pulsates as the piston forces air out of the top of the chamber at the top of each compression stroke. You can actually feel it if you shoot air at your hand from up close. That pulsation does effect the smoothness of the flow of paint. But not to the point of your examples. Like I said, I used one for more then 10 years, and could do free hand camo paint schemes without any issues. Your 1:1 ratio of thinner to MM enamel paints shouldn't be that much unless you're shooting blacks or very dark colors. Mid colors and lighter should be 2 parts paint to 1 part thinner, as the MM enamel paints are on the thin side compared to acrylics. I mostly paint these days with either Arcylics or lacquers, and each has their own psi ranges for my painting system. Enamels are right in the middle. Start with no more then 15 psi and test with it. Your compressor isn't very powerful, so that's why I suggested 15 rather then 12 psi max. If you find that opening up the cone doesn't help the flow rate, then increase the psi a little at a time till you're able to shoot a smooth line. Thanks for the info, Joel. I've tried looking around for a compressed air tank and I've found I have no idea what to look for. 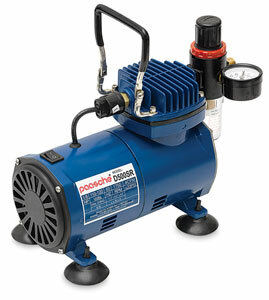 The compressor I have is a 1/8HP Paasche D500. I'm seeing a lot of compressor/tank combos online for ~$150-200, but considering I spent about $110 on this compressor just last year, I'm not interested in buying a whole new one just to get the tank. The thing is, I can't seem to find any smaller tanks online. The smallest I can find is a 5 gallon, 135psi Craftsman holding tank (which seems like a real steal at only $30), but I'm not sure if 5 gallons is overkill, or if my 1/8HP compressor can even fill up 5 gallons in a reasonable amount of time. Kevin, The holding tank/compressor is sold as a unit. If you ever decided to go with a separate tank, Buy a used tank and gauge from a dive shop, and use CO2 to fill it. The tank will last a long long time. Your compressor is fine. Just that the air is delivered in pulses. By the time it gets to the gun itself, there shouldn't be any issues to be concerned with. The issue now is to get to the point where you can airbrush a consistent line. Kevin, you might want to search Youtube to see if anyone made a video on how to disassemble your particular airbrush. Then as others have already said, clean it thoroughly especially the needle and nozzle. Kevin, have you turned the top black knob so that it reads 12-15 psi, then tried to paint? I'm pretty sure that will solve your issues. Thin the enamel paint 1:1 to start with.